Human Resources information system (HRIS) is essential for companies to manage their benefits plans and their employee information. Benefits management technology is no longer a nice to have, but a necessity to help HR manage both a sea of information and the money spent on benefits plans, as HR faces limited resources and constantly changing data. But how do HR and other executives know they are selecting the best HR information technology to manage all of the details, and that the solution they select will stand the test of time? Following are the key questions to ask and answer in the process of selecting Human Resources information technology. What Is the Degree of Flexibility and Scalability That the HR Information Technology Software Provides? HR professionals should determine if the software can import data from multiple Excel spreadsheets, databases, and paper documents and the level with which it can interface with all kinds of other systems and data needed. The software should be able to take in and filter information from multiple sources. Ideally, this process should also be automated. Many online enrollment solutions require that data be manually manipulated before it can go to a carrier to update their systems. Automation of the update format, transmission schedule, and delivery method can help to eliminate billing and eligibility issues. Will the Software Be Able to Accommodate HR's Company and Benefits Carriers Rules? A truly capable enrollment engine will evaluate each enrollment activity and apply any necessary combination of rules, messages, prompts, and options specifically designed to meet the exact eligibility requirements desired. The software should accommodate any eligibility rules that the company and carriers have. Will the HR Information Technology Be Able to Grow and Scale With the Organization? HR should assess the technology's ability to grow as the company hires new employees, offices, benefits changes, and rules. HR should ask about the thresholds for each of these elements. Is the Technology Software Able to Integrate With Other Systems? Payroll and other functions often share much of the same information as the benefits management. HR can obtain greater efficiencies when data and other employee information entered into one system are shared with another system. Tracking employee recruitment is another needed function. Who Is Responsible for Implementing, or Building, the Solution? What level of training is involved? Some solutions require the client to be very involved with the initial implementation, which can be overwhelming for already busy HR administrators. HR should have a clear understanding of the level of training and technical expertise that will be required and the amount of time expected. Questioning solution providers on this topic can provide insight into subtle areas that might initially appear simple, yet involve significant technological expertise. HR can then determine specific tasks that may be so cumbersome as to realistically impede completion, potentially reducing HR information technology value and ROI. Is There a Charge If Training Is Involved? Costs of training should also be assessed—including time away and travel expenses for off-site travel. HR needs to become aware of all hard and soft costs involved in the HR information technology adoption. The answer to this question should be the Human Resources organization. Companies should be able to transport their data to any Application Service Provider (ASP). If the data resides on a carrier's proprietary server, the company may sometimes be charged additional fees should it switch carriers. What types of maintenance and upkeep are required? When software is installed on a company's on-site workstations or servers, regular updates to that technology are often required and may be cumbersome to plan for and manage. Updates to HR information technology are often made automatically with software available online through an Application Service Provider (ASP) or Software as a Service (SaaS) model. What Security Measures Are Built Into the HR Information Technology? If the software is available online, through an ASP or SaaS model, the provider should offer daily backups, backup servers, and added protective layers. Additional systems and procedures should be in place to safeguard information from being lost or accessed by unauthorized personnel. HR, in consultation with other managers, should have exclusive authority to decide who will be allowed access to the HR information technology and what degree. Will Employees Be Able to Enroll in Benefits Plans and Make Changes in Real-Time to Their Personal Data and Plan Choices? Employee access should be a given, considering the widespread, general access to computers. The majority of the employee population have internet access at home. Employee self-service provides a huge potential to save time and money. A good self-service system will guide employees smoothly through entering information about themselves and their dependents. The system should clearly present the plans available and enable employees to make selections at their convenience, simplifying these actions throughout the process with wizards. Employees should also be able to add dependents and change information as necessary, 24 hours a day, seven days a week, year round. These are additional questions to answer as you assess your organization’s Human Resources information technology needs. Will the Technology Provide Human Resources With the Authority to Decide Who Will Be Allowed Access and to What Degree? Along the same vein providing employee access, the technology should give HR the final say. HR should have the authority to approve all data before it is transmitted to carriers, and should also determine the extent to which employees and others have access. What Types of Reporting Capabilities Are Available From the Hr Information Technology? Reporting technology should offer multiple views and formats (spreadsheet, PDF, HTML), big picture assessment and the ability to drill down to enhance decision-making. HR should be able to assess, at any time, enrollments in specific plans, outstanding actions, and changes in employee demographic information in relation to benefits and other employee data. Does the Software Offer Specific Features to Help HR Save Time? Depending on its own departmental needs, HR might want to inquire about the technology’s ability to process information in batches, manage notifications and billing for COBRA policies, provide self-billing and bill reconciliation tools, and specific reporting. 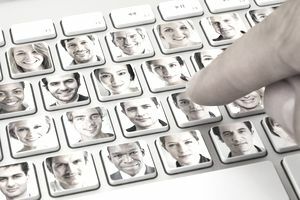 Does the Software Offer Specific Features to Help HR Communicate Better With Employees? Some programs give HR the flexibility to communicate with employees on a number of levels - via mass email, electronic bulletin boards, and by specific filter criteria (such as location, department, insurance plans, enrollment status, retirement status, and others) through the HR information technology system. Having a number of means to communicate can further automate processes and help HR to better target messages. enhance confirmation of eligibility when employees go for care. How Will Information Be Exchanged With Carriers? fostering a proactive relationship with each carrier to improve the relationship of data exchange. Knowing who is responsible for each task is essential to understand a product offering fully. Each software provider will offer a different level of integration in providing some, to all, of the tasks outlined above. HR should look to work with vendors that demonstrate strong, ongoing, seamless relationships with the company’s selected carriers. Many providers enable transmission of a generic ANSI 834 file, which may or may not be accepted by the carrier, a factor often influenced by the size of the group. Managers should look for providers that offer clean, validated transfers (ensuring the eligibility of the transaction), customized to each carrier’s needs to avoid issues. They should also look to providers that have a dedicated EDI (Electronic Data Interchange) department to interact with the carrier’s own, specific transfer language. Is there an additional charge for service? HR should determine the level of access to help that is provided and what constitutes customer service—online help via a database, online chat, email support, conversations with a live person, or a combination thereof. Given the sensitivity of benefits and other HR information, managers should expect a response to inquiries within 24 hours from a direct contact that can help. What Is the Cost of the HR Information Technology System and Does It Outweigh the Benefits? HR should assess the complete cost of the HR information technology system, including all annual, monthly, and one-time charges, alongside the benefits provided. A slightly more expensive system may more than pay for the difference with features that enable employees to maintain their own records and offer greater convenience, time savings, and accuracy. These factors should be considered and weighed in selecting an HR information technology system. The need for HR information technology systems is increasing. With HR staff finding a vast array of options in HR information technology systems, it is increasingly important to analyze and weigh all options available. Choosing an HR information technology system should be looked at as an investment that will grow with the department and the company’s needs. These questions will lead you to the appropriate HR information technology system for your company. What Is the Degree of Flexibility? Can Software Accommodate HR's Company Rules? Will HR IT Grow With the Company? Can Software Integrate With Other Systems?